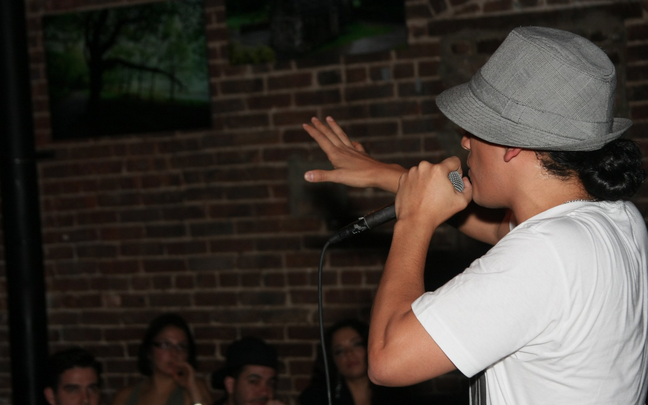 Goya Robles at his album release party in 2012. Me and spoken word don’t have much of a relationship. When it first appeared on my radar in 2002 via HBO’s Def Poetry Jam, I couldn’t watch it (I was working nights then) and somehow [wrongly] figured it wouldn’t be my thing. A few years later, while working at a radio station in New Jersey, my boss gave me a a pair of tickets to Def Poetry Jam on Broadway. I figured, why not? I was instantly blown away. It was like rap, which I was a fan of, but at a varied tempo and performance style, and subjects ranged from life in the city to feminism. Still, I didn’t keep up with it much. Though it was at its height then, venues hosting spoken word were few and far between when I lived in New Jersey (outside of college campuses, that is) and as a journalist working crazy hours in the middle of the Garden State, I wasn’t able to frequent New York City’s Nuyorican Poet’s Cafe. As they say, life gets in the way. Silly me. I shouldn’t be surprised at all that the Internet is rife with spoken word videos. And it gives me great pleasure to share the latest by one of my frat brothers (yes, I was in a sorority in college), Goya Robles. If you’re a fan of CBS’s The Mentalist, you’ll be familiar with Robles as he starred in an episode two weeks ago. He’s an actor (watch his reel here) and spoken word artist (and lots, lots more) and “Heart Music” is his latest.